Accent Flowers serves the Franklin, TN area with high quality floral arrangements and flowers of all types. No matter the occassion, whether it's Valentine's Day, a birthday, graduation or other holiday, we pride ourselves on the quality, service and extraordinary floral arrangements we have been providing the Franklin area residents. Looking for a Florist in Franklin? 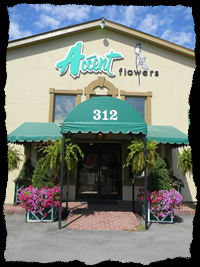 Accent Flowers is a full service florist offering a wide array of products and services appropriate for anyone. Any occasion will benefit from our fresh floral, silk floral, or plants, not to mention our fruit and gourmet baskets filled with seasonal fruits, snack items, and specialty sweets. Our fresh flowers are flown in twice weekly and we have our own greenhouse onsite to ensure that the plants we send are in optimum condition. At Accent Flowers, we believe in giving our customers the highest quality and the freshest flowers possible. We continually strive to create elegant and unique custom arrangements for our clients, satisfaction guaranteed. If you are looking for the finest floral arrangements in town, give us a call to create the most memorable floral arrangement possible.